Achalasia is a relatively rare disorder of the smooth muscle of the esophagus. The esophagus is a muscular tube that carries food and liquids from the mouth to the stomach. 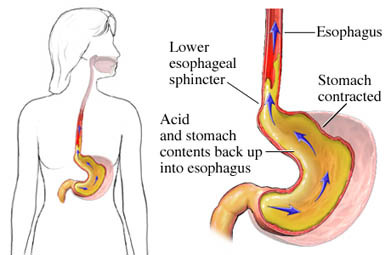 Achalasia makes it difficult for food and liquid to pass into the stomach from the esophagus. There is a muscle called the lower esophageal sphincter (LES). This is where the esophagus meets the stomach. When not swallowing, the LES remains closed to keep food, liquid, and stomach acid from moving back into the esophageal tube. When swallowing, nerve signals tell muscles to contract to push food down the esophagus (an action called peristalsis). This allows the LES to open. While achalasia is associated with the loss of nerve cells in the esophagus, the cause of this process is unknown. There are no known risk factors for achalasia. Symptoms of achalasia can occur between the ages of 25 and 60. Symptoms rarely develop in children. Symptoms tend to be mild at first, and then grow worse over months or years. The main symptom is difficulty swallowing solids and, as the disorder progresses, liquids. Nearly all people with achalasia have difficulty swallowing both solids and liquids. Vomiting or regurgitating food or liquids. This may occur during sleep. This can cause a person to inhale food particles or liquid, which can lead to aspiration pneumonia and other respiratory infections. Manometry—A tube is inserted down the throat to test the pressure in the esophagus and the stomach when swallowing. Upper GI series —X-rays are taken with contrast material (also called a barium swallow). Upper GI endoscopy —The esophagus is viewed directly through a fiberoptic tube to look for other causes of the symptoms. This treatment stretches the LES muscle. A thin tube is inserted into the throat. At the end of this tube is an uninflated balloon. When the tube reaches the LES muscle, the balloon is inflated. Pneumatic dilation has a high success rate. It is the primary treatment in most people, although the procedure may need to be repeated. Small incisions are made in the LES to help it relax. This is called Heller myotomy surgery. This can usually be performed via laparoscopy, making it a relatively minor surgical procedure. Because the LES is partially cut, about some people experience gastroesophageal reflux symptoms after this surgery. Tiny amounts of botulinum toxin type A are injected into the LES. Botulinum causes the LES to relax, which makes it easier to open. Since the effect is temporary, repeat injections are almost always needed. The response decreases with successive injections. Certain medications may help those that cannot tolerate surgery and do not have success with botulinum therapy. The symptom relief is temporary. There are no current guidelines to prevent achalasia because the cause is not known. Achalasia. EBSCO Plus DynaMed website. Available at: http://www.dynamed.com/topics/dmp~AN~T114877/Achalasia . Updated April 11, 2016. Accessed April 4, 2018. Achalasia and esophageal motility disorders. The Society of Thoracic Surgeons website. Available at: https://ctsurgerypatients.org/lung-esophageal-and-other-chest-diseases/achalasia-and-esophageal-motility-disorders. Accessed April 4, 2018. 2/13/2014 DynaMed's Systematic Literature Surveillance http://www.dynamed.com/topics/dmp~AN~T114877/Achalasia : Vaezi MF, Pandolfino JE, Vela MF. ACG clinical guideline: Diagnosis and management of achalasia. Am J Gastro. 2013;108(8):1238-1249.